I love finding new kid-friendly gems in destination cities! I’ve said it before, but I’ll say it again: families don’t have to settle for cheap hotels in the suburbs while city touring. Family-friendly, downtown hotels do exist. Our latest find: the Hyatt at Olive 8. Located in the heart of Seattle’s downtown, the Olive 8 is just steps from the impressive convention center. One would assume this would mean the hotel is overrun with business travelers, but this is not so! We visited mid-week, and were still in the company of numerous family groups. My kids think this is due to their large indoor pool and whirlpool hot tub and their restaurant, Urbane’s, ‘For Kids, By Kids’ farm-fresh menu. As the sliding glass doors open to usher you into the Olive 8’s lobby, the first thing you notice is the minimalist, glass and steel decor. I loved the ultra-modern layout of Olive 8: the lobby looks out on downtown from expansive glass panes, and the common areas are all open, with wide hallways and high ceilings. This less-is-more mentality extends to energy consumption: that the Olive 8 is the first LEEDS certified Seattle hotel. In our room, our key cards turned on and off lights (to ensure they automatically turn off upon exiting), linens and towels are replaced on request, and the heating and air units are eco-friendly. Even the toilets offer two flushing options to reduce water usage, which the kids found delightful (and hilarious). We stayed in adjoining rooms as a family of five (and had plenty of room) and all rooms come equipped with mini-fridges (a staple!) and iPod docking stations (a very nice perk). The in-room coffee service was not half-bad, and I liked that Tazo teas were offered as well. 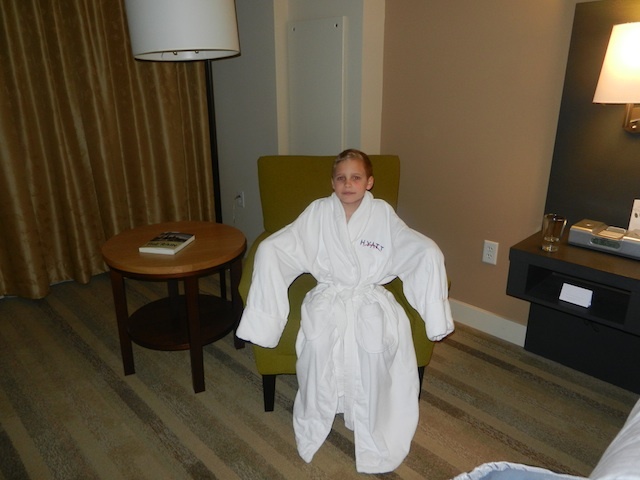 My kids loved the thick Hyatt bathrobes, and I liked how many outlets I had to charge electronics. Wifi is available in-room for a fee. We visited the Olive 8 on a cold December night. The kids jumped right in the pool, which is open later than most (until 10:30, open at 5:30 am), and my husband and I appreciated that the Hyatt StayFit gym (a staple of all Hyatts) is located adjacent. We could tag team a workout while the kids swam. The Olive 8 does have a spa, though we sadly didn’t have time to check it out. The Olive 8 has both a marketplace where families can buy snacks and staples, and a full restaurant, Urbane. We ate breakfast at Urbane at the suggestion of both hotel staff and locals. 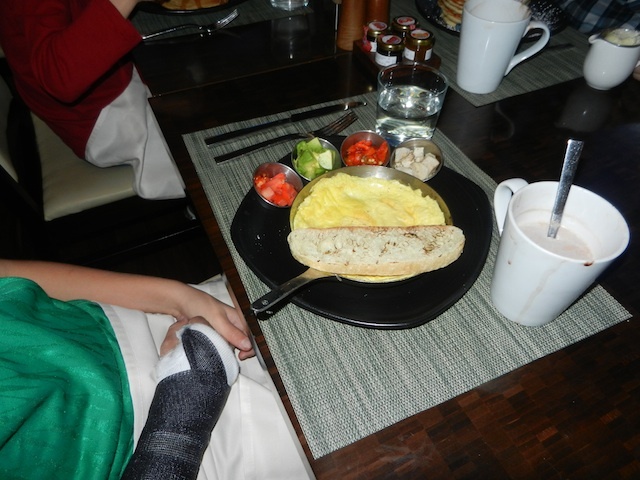 Urbane adapts Hyatt’s For Kids, By Kids menu, developed by kids and a young chef. While Urbane is by no means an economical breakfast choice for families, it does promise locally sourced, healthy options. The dining room echoed the rest of Olive 8’s elegant design, and the service was friendly. While staying at Olive 8, you’re within walking distance of the Space Needle and Pacific Science Center, and right on metro lines to Pike’s Place Market and the waterfront. You’ll pay for your comfort and prime location: rates start at $152 for a single king room. But why not end each of your busy touring days with a swim and a warm soak, healthy food, and comfortable, eco-friendly digs? At the time of our visit, standard, king bedrooms started at $153 on non-holiday nights. We opted for two adjoining rooms with queen beds, and were comfortable as a family of five. The Olive 8 is located at 1635 8th Street, Seattle. From I-5, take Pike Street. The hotel is easily accessed from I-90, too. As I disclose whenever applicable, we experienced Hyatt at Olive 8 as guests of the hotel. While we appreciate this opportunity to share great hotel finds with our readers, it came with no expectation of a positive review. My family watches Top Chef and I noticed the Olive 8 building has been featured prominently this season. We’ll have to give the hotel a try the next time we drive up from Portland for a Seahawks or Mariners game.